The last few months have been packed, with not as much time to read out loud as I would like. A few of these are from the end of the school year, and some are from the last few weeks. One thing I love about summer is more time to read books out loud together!! 4 stars: Light-hearted and feisty. Princess Cimorene is tired of everybody telling her she can't do things--like learn to fence, or learn to cook, or take politics, or ... pretty much everything except curtseying, embroidery, and dancing. So she runs away and ends up in the cave of the dragon Kazul. Before she knows it, she is plenty busy--cooking dessert for dragon meetings, putting Kazul's horde in order, and fending off pesky knights. 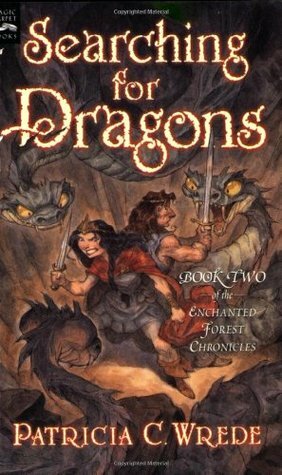 When the king of the dragons is fatally poisoned, Cimorene and Kazul work together to figure out who could have done it and why. 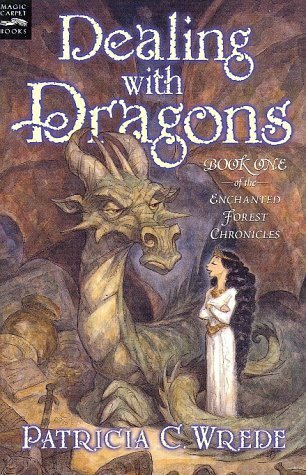 As I'm thinking back on it, this was probably one of the first fractured fairy tales I read--even though it doesn't follow any particular fairy tale, it takes all of the expected conventions and turns them on their heads--which is what makes it so enjoyable! My daughter wanted to go on to the next one immediately after finishing this. Luckily our library had it checked in! 4 stars: Adventure, humor, and a faulty flying carpet covered in pink teddy bears. Also, just a touch of romance. Mendanbar, the King of the Enchanted Forest, has done his best to get out of social engagements and particularly any entanglements with princesses. So he is less than pleased when his urgent visit to the King of the Dragons, Kazul, lands him talking to a princess instead. Although, she is different than any princess he has encountered so far. You see, a large patch of the Enchanted Forest has died off--been entirely sucked clean of magic and life. He found some dragon scales at the site. Unfortunately, King Kazul is missing. Princess Cimorene was about to go looking for her, when Mendanbar happened to show up. For various reasons, they decide this is a search that should be undertaken together, starting with a visit to the giantess Ballimore and her husband. They will get mixed up with all sorts before they get to the bottom of it all....and possibly fall in love. Told from Mendanbar's perspective, but with all of our favorite characters from the first book back again. We got a kick out of the various fairy tale characters that made their way into this one, from the giants, to Herman the gold-spinning dwarf with a houseful of children to look after. Telemain the magician was pretty funny, too. Soon after finishing this one, we got it on audio and loved it! There was a full cast, and the various characters did accents that I couldn't quite manage. 3 stars: Comfortable storytelling, with a few dramatic twists and turns. Four siblings living in NYC decide to pool their allowances for each one to get a special Saturday doing what they want to do. Mona, the oldest, aspires to be an actress, Rush wants to be a concert pianist, Ran dances and paints, and the youngest--Oliver--just wants to be involved. Each of their Saturdays takes them to unexpected places and they come home to share with their siblings. This was a little slow for me, but my kids really liked it. It was obviously written in a more innocent era. These kids, the oldest is 13, go by themselves out into the city for their special days, long blocks and bus rides away. I think my kids enjoyed the idea of having so much independence, and also seeing what happened as a result of the experiment. They also really liked Isaac, the dog. 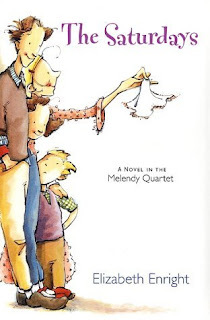 4 stars: Drama and fun as the Melendys move to the country. Mona, Rush, Ran, and Oliver are back (with Cuffy, Willy Sloper, and Father, of course.) 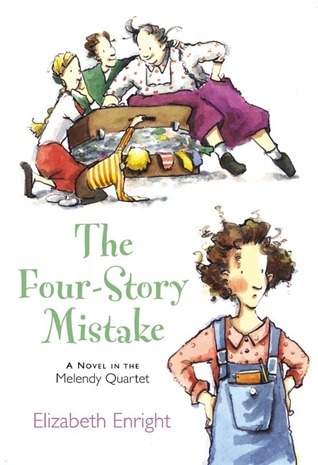 The Melendy's have had to move out of the big city, to a house in the country called The Four-Story Mistake. It's hard to leave everything they are familiar with and love, but they soon find new delights. For one thing, there's the creek out back of the house: a frozen waterway ready for exploring in the winter, and full of caddis houses, fish, and other life in the summer. There's the cupola up top of the house, and even a secret room! It is a year full of growth, secrets, friendship, and fun, as the Melendy's make friends in town and have adventures at home. 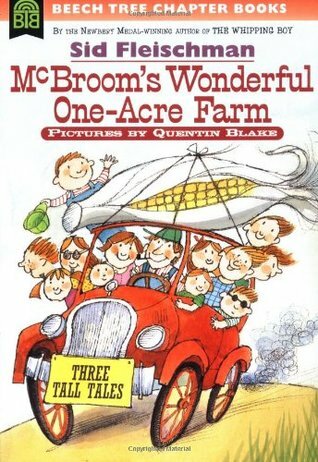 As with the first book, this one was a bit on the slower side for read-alouds. Not that that's a bad thing, necessarily. It had longer chapters, with a picture maybe once a chapter. We would read 1 or 2 chapters in one sitting. Even with the slower pace, it's one where I think the kids either wish it were them living it, or at least that the Melendy's could be their friends in real life. I liked this one better than the first, actually. There were a couple of parts that made all 3 kids break out laughing. 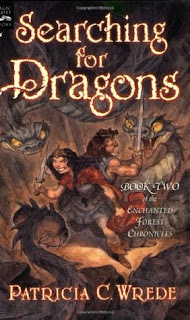 The adventures are on the ordinary side--no magic--but very believable; from Oliver's discovery of the cellar, to Ran's crazy bike ride into town, it's all stuff that could happen. The adults are mostly hands-off, but they come to the rescue when needed. 5 stars: Witty, funny, and memorable. Also, short! Josh McBroom, his dear wife Melissa, and his 11 redheaded young'uns, pack up to go West after many years of struggling along on their farm. Along the way they meet a shyster who sells them an 80-acre farm for a pittance. Turns out, the farm is 80 acres stacked on top of each other, at the bottom of a muddy 1-acre pond. Well, the pond dries up, and when it does, the McBroom family discovers the most marvelously rich soil in all the land! Entire crops can be planted and harvested within a couple of hours. Even spare change has a way of growing, if left in the dirt by a careless youngster. That doesn't mean that McBroom and his family have everything easy, though. No sir! They have the prairie wind to deal with, and grasshoppers, and the man who sold them the farm wanting it back. With ingenuity, perseverance, and nothing but the whole, unvarnished truth (wink wink) they will prevail! This was so great! Filled with unforgettable images, like the wind shoes and a giant ear of corn turning into popcorn. Quick and easy read, with short chapters told in a dialogue format. Josh himself tells the stories, and he would rather sleep in a tree than stretch the truth. The most fun part as the reader was the frequent recitation of all 11 children's names (said as fast as possible, of course!) "WilljillhesterchesterpeterpollytimtommarylarryandlittleClarinda!" I have to admit that part made me smile every time, partly because I am from a family of 11, and if I had a quarter for every time someone asked me to say all the names, I would be richer than McBroom! To this day I can rattle them off in 3 seconds flat. So this was right up my alley! Bonus: I have taken to calling my children "my lambs" and they answer (with minimal eye-rolling)! Yes! I'm so excited for all the fun books to read together this summer! I have a long list of choices, and I'm hoping we'll make it through most of it. What are you reading to your kids this summer? Oh, I will have to pass the Dealing with Dragons series along to my oldest daughter. It sounds like a great series! I will also have to check out that last one. Thanks for the recommendations! If you like McBroom's Wonderful One-Acre Farm, there are a few more of those, as well.